Something special to remember your loved one with. This style will stand out from the rest with its creative design. A unique tribute. Brighten anyone's special day with this box of mixed gerberas. 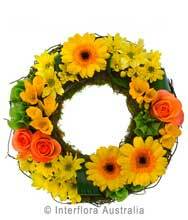 Also available with mixed flowers. Want to add a balloon? Ideal for wedding anniversaries and Valentine's day. 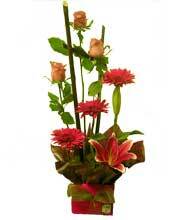 Select from our stunning range of romantic arrangements to spoil the love of your life. Why not indulge them with a box of chocolates? Balloon? Teddy bear? 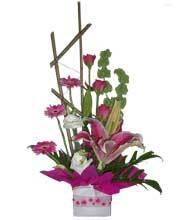 Show mum how much you appreciate her this Mother's Day by sending her a beautiful mixed arrangement. 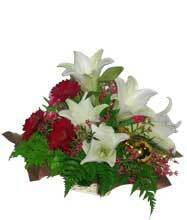 Christmas table centre to bring joy and festivity to any table setting. Also available festive floral designs to decorate any home, as well as a wide range of gifts, hampers and Christmas treats. Please Note: Arrangements may vary slightly from those pictured due to seasonal availability and/or colours on hand at time of order. 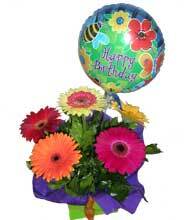 Bay Flowers and Gifts reserve the right to make appropriate substitutions using the best flowers available and maintaining the full value of your order. Prices quoted do not include delivery.